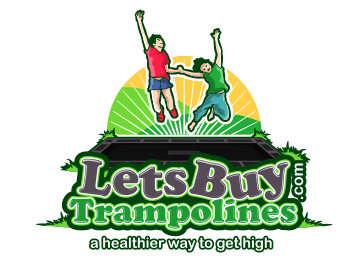 The manufacturer is: Capital Play Ltd., a company organized in the United Kingdom whose principal office is located at Units 2 and 3 Higher Park Farm, Halebourne Lane, Chobham, Surrey, GU24 8SL, United Kingdom (“SELLER”) warrants that the trampolines and associated equipment (the “Product”) and sold or provided by SELLER to the first end user (“BUYER”) are produced according to usual practices, customs, standards, specifications and tolerances of trade prevailing in the country of origin at the time of production and shall, subject to the limitations and exclusions set forth below, be free from defects in design, material, and workmanship. (3) BUYER complies with all other sections of this Limited Warranty. The procedure described in this Section 2 shall hereinafter be referred to as the “Warranty Claim Procedures.” For the Limited Warranty to apply, the warranty claim must be filed within the Warranty Period (defined in Section 4) and within five (5) days of the date BUYER discovered the alleged defect. Notwithstanding the foregoing, in the event that SELLER determines, in its sole discretion, that BUYER reasonably should have discovered the alleged defect before its actual discovery, this Limited Warranty shall not apply. In order to determine whether the Limited Warranty should apply, BUYER shall provide any information to SELLER, including pictures where applicable, via telephone, email or any other appropriate means of communication. SELLER may, at its sole option, require that the defective Product be shipped to the address provided by SELLER with mailing or shipping charges prepaid. BUYER shall pay all expenses associated with returning the Product to SELLER, including, without limitation, the costs of shipment, import taxes, duties and tariffs if applicable. If SELLER determines that the returned Product is covered by the Limited Warranty, SELLER agrees to pay all of the foregoing and all expenses of returning any replaced Product to BUYER. If the Product is proved to SELLER’s satisfaction to be defective within the Warranty Period (defined in Section 4), SELLER’s obligations under this Limited Warranty shall be limited to either or repairing or replacing the Product, at SELLER’s sole discretion, and only if such defect was caused solely by defective design, workmanship and/or materials. Such repair or replacement shall be SELLER’s sole obligation and BUYER’s exclusive remedy hereunder and shall be conditioned upon BUYER’s fulfilling its obligations under SELLER’s Warranty Claim Procedures. 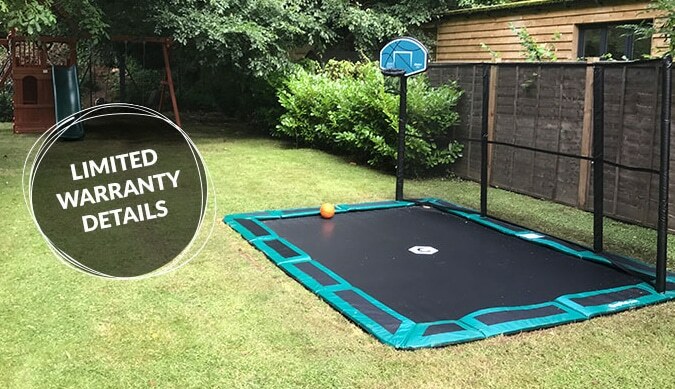 This Limited Warranty of the Product applies for the following durations: Steel Frame & Retaining Wall: 10 years, Jump Mat & Springs: 5 years, Padding and net: 2 years from the date the Product is sold to the BUYER (the “Warranty Period”). The Warranty Period shall not be tolled for any reason. No action by SELLER or BUYER shall operate to extend or revive this Limited Warranty without the prior written consent of SELLER. SELLER expressly reserves the right to inspect the Product and its components, parts, and BUYER’s installation, use, maintenance, and any other acts or omissions of the BUYER, when determining whether an alleged Product defect is covered by the Limited Warranty. This Limited Warranty is provided by SELLER, and it contains the only express warranty provided by SELLER to BUYER. SELLER does not authorize any other person, including distributors, to give any other warranties on SELLER’s behalf. SELLER DISCLAIMS ANY EXPRESS WARRANTY NOT PROVIDED HEREIN AND ANY IMPLIED WARRANTY, GUARANTY OR REPRESENTATION AS TO PERFORMANCE, QUALITY AND ABSENCE OF HIDDEN DEFECTS, AND ANY REMEDY FOR BREACH OF CONTRACT, WHICH BUT FOR THIS PROVISION, MIGHT ARISE BY IMPLICATION, OPERATION OF LAW, CUSTOM OF TRADE OR COURSE OF DEALING, INCLUDING IMPLIED WARRANTIES OF MERCHANTABILITY AND FITNESS FOR A PARTICULAR PURPOSE. SELLER FURTHER DISCLAIMS ANY RESPONSIBILITY FOR LOSSES, EXPENSES, INCONVENIENCES, SPECIAL, INDIRECT, SECONDARY OR CONSEQUENTIAL, INCIDENTAL, AND CONTINGENT DAMAGES WHATSOEVER, INCLUDING DAMAGES ARISING FROM OWNERSHIP OR USE OF PRODUCT. Implied warranties in jurisdictions where they may not be disclaimed shall be in effect only for the duration of the express warranty set forth herein. If BUYER has a claim under this Limited Warranty or under any implied warranties provided to BUYER by state law, BUYER may not file a court action based on that claim any later than one (1) year after BUYER’s right to file a court action accrues. In those states which do not allow this limitation on the time period for filing a court action, this provision is inapplicable. SELLER’s liability with respect to the Product sold to BUYER shall be limited to the warranty provided herein. SELLER SHALL NOT BE SUBJECT TO ANY OTHER OBLIGATIONS OR LIABILITIES, WHETHER ARISING OUT OF BREACH OF CONTRACT, WARRANTY, TORT (INCLUDING NEGLIGENCE AND STRICT LIABILITY) OR OTHER THEORIES OF LAW, WITH RESPECT TO PRODUCTS SOLD OR SERVICES RENDERED BY SELLER, OR ANY UNDERTAKING, ACTS OR OMISSIONS RELATING THERETO. Without limiting the foregoing, SELLER SPECIFICALLY DISCLAIMS ANY LIABILITY FOR PROPERTY OR PERSONAL INJURY DAMAGES, PENALTIES, SPECIAL OR PUNITIVE DAMAGES, DAMAGES FOR LOST PROFITS OR REVENUES, SERVICES, DOWN TIME, SHUT DOWN OR SLOW DOWN COSTS, OR FOR ANY OTHER TYPES OF ECONOMIC LOSS, AND FOR CLAIMS OF BUYER’S CUSTOMERS OR ANY THIRD PARTY FOR ANY SUCH DAMAGES. SELLER SHALL NOT BE LIABLE FOR AND DISCLAIMS ALL CONSEQUENTIAL, INCIDENTAL AND CONTINGENT DAMAGES WHATSOEVER. SELLER’S TOTAL LIABILITY ARISING IN CONNECTION WITH THE PRODUCT SHALL BE LIMITED TO THE VALUE OF THE PRODUCT SOLD TO BUYER. SELLER NEITHER ASSUMES NOR AUTHORIZES ANY THIRD PARTY TO ASSUME FOR IT, ANY COMMITMENT OR ASSUMPTION OF LIABILITY OF ANY KIND IN CONNECTION WITH ITS PRODUCT. Any description of the Product, whether in writing or made orally by SELLER or SELLER’s agents, specifications, samples, models, bulletins, drawings, diagrams or similar materials used in connection with BUYER’s order, are for the sole purpose of identifying the Product and shall not be construed as an express warranty. Any suggestions by SELLER or SELLER’s agents regarding use, application, or suitability of the Product shall not be construed as an express warranty unless confirmed in writing by SELLER to be such. If a part, provision or clause herein, or the application thereof to any person or circumstance is held invalid, void or unenforceable, such holding shall not affect and shall leave all other parts, provisions, or clauses of this Limited Warranty remaining and in full force and effect.